No. The paper petition cannot, and will not, be transferred into an online e-Petition. No. The paper petition cannot be merged with a newly created e-Petition. No. The paper petition cannot be put online through change.org, sumofus.org or avaaz.org. Yes. The paper petition is still powerful, valid and current. 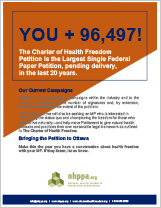 NHPPA’s efforts to continue collecting signatures will make a significant difference as we seek the MP who will introduce the Charter of Health Freedom to House of Commons. 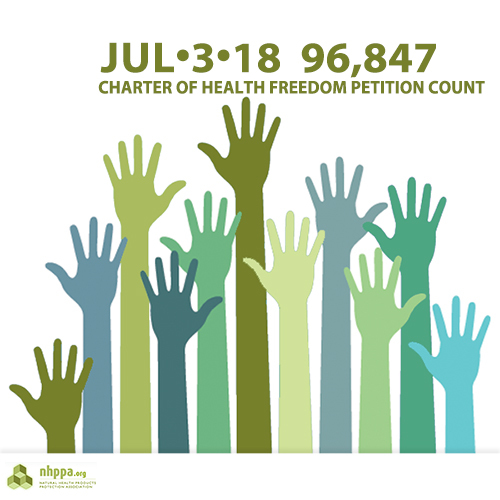 How Does the Charter of Health Freedom Petition Compare? The largest federal paper petition in Canadian history to be filed with the Canadian Clerk of Petitions stands at 630,542 signatures. Delivered by The Body Shop Canada on May 28, 2018, this petition calls for a ban on the sale and manufacture of animal-tested cosmetic products. This petition has not yet been presented in the House of Commons. At 625,510 signatures, the second largest paper petition to be presented to the House of Commons in Ottawa in the last 70 years was for the creation of the Canadian Bill of Rights (February 9, 1949). The presentation of petitions has been a feature of the Canadian House of Commons since the time of Confederation. But a lot has changed since 1867. The process of petitioning has been tabled and reviewed in the House of Commons since 1994. The Standing Committee of Procedure and House Affairs began to examine measures to achieve more direct participation by citizens, including debates on petitions. It was only 25 years ago that the House of Commons began keeping track of delivered petitions. In December 2015, the Canadian Parliament began accepting e-petitions. Under the new system, e-petitions that garner at least 500 signatures and are sponsored by an MP will be tabled in Parliament. E-Petitions are only open for signature collection for a period of 120 days and, once tabled in Parliament, will receive a response from the government within 45 days. E-petitions are exciting and new, and they create an opportunity to have an issue presented to Parliament in a relatively short period of time. However, they cannot be combined with or replace an already pre-existing paper petition. It would be an extraordinary amount of work for the Clerk of Petitions or the Privy Council to cross reference the signatures gathered on the paper petition with any signatures collected online. NHPPA would have to start a brand new Charter of Health Freedom e-Petition, from scratch, and it would have to go through the validation and acceptance process. Our petition must therefore remain a paper petition. 130,452 signatures, Canada’s largest e-petition to date, presented in the House of Commons on March 23, 2017, calling for an end to Canada’s “First Past the Post” electoral system. 86,082 signatures, the second largest e-petition to date, presented in the House of Commons on September 19, 2018 proposed the repeal of Bill C-71, An Act to amend certain Acts and Regulations in relation to firearms. 69,742 signatures, the third largest e-petition to date, presented in the House of Commons on October 6, 2016 asking that Parliament recognize that extremist individuals do not represent the religion of Islam. See our April 2018 Paper vs e-Petition Update (pre-Total Health Show). Find out more about the Charter of Health Freedom and how it is designed to protect your rights and freedoms.